After two nights of B&W, it was almost kind of jarring to start this movie and have it play in color. Especially since one of the first scenes is pretty gory by 1950s standards, showing the aftermath of a man being killed in a hydraulic press. I've seen David Cronenberg's 1986 remake a few times (BrundleFly! ), but never the original, so I was looking forward to this one. Now, The Fly in a nutshell, in case you haven't had time to hear about it in the past 50 years, or seen it spoofed on The Simpsons Treehouse of Horror VIII. 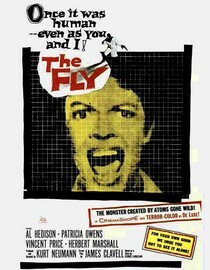 Brilliant scientist creates a teleportation device, decides to test it on himself, and only finds out once it's too late that a fly was in the device with him. Scientist is left with the head and one arm of a fly, while a fly with a human head and arm is loose someplace in his house. Three days into Project Horror, and one thing I've already noticed is the much different pacing and intensity between modern horror movies and classic ones. Where most modern ones ratchet up the tension and atmosphere pretty quickly, the classics tend to build over the course of the movie to one big reveal, one big scary moment. It's not good or bad, just different. I have to keep reminding myself of that, because to a modern watcher, the more deliberate pace can also seem much less exciting. Still, I have to give this movie credit. What could have been another forgettable 1950s creature feature is still considered an influential classic today, and I think it's because the focus isn't even so much on the creature as it is on the effect that his transformation has on his family. The most intense scene in the movie isn't when his fly face is finally revealed, it's when his wife is frantically trying to capture the fly with his head so that he can try to reverse the process. And of course the famous final scene, where we see that same fly trapped in a spider's web, screaming for help as he's about to be devoured... That's the one part of this movie that I'd seen before, and even knowing that it was coming, it still delivered. Where was I? Right - 4 flies out of 5. My personal horror of classic child actors is the kid in Hitchcock's The Man Who Knew Too Much, who sings "Que Sera, Sera" with Doris Day. I want to punch them both in the face.